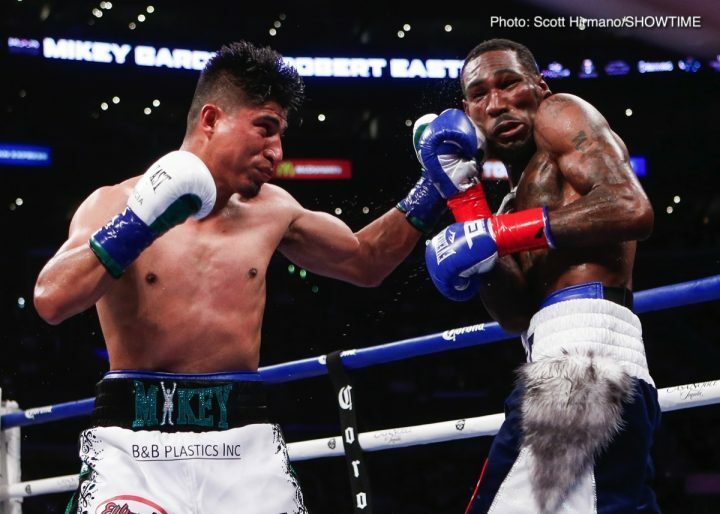 By Jeff Aranow: In disappointing news, Mikey Garcia (39-0, 30 KOs) will be making a defense of his IBF/WBC lightweight titles against IBF mandatory Richard Commey (27-2, 24 KOs) next rather than moving up to 147 to challenge unbeaten IBF welterweight champion Errol Spence Jr. (24-0, 21 KOs) for his title, according to ESPN. The deal for the Mikey Garcia vs. Richard Commey fight was made last Monday. The boxing world isn’t reacting too well to news of Mikey choosing to fight Commey next rather than Spence. The fans see Garcia as chosen to duck the Spence fight in favor of Commey, who lost to Garcia’s last opponent Robert Easter Jr. two years ago. The fans were giving Garcia high respect when they heard that he wanted to move up two weight divisions to challenge Spence for his IBF welterweight title. Hearing that Garcia won’t be fighting Spence is bitter pill, especially given that he’s taking on Commey, a guy that was batted around the ring by Garcia’s last opponent Easter Jr. in 2016. If Garcia isn’t going to fight Spence, the fans want him to fight Vasyl Lomachenko at lightweight. He’s the only one in the 135 pound weight class that the general public wants to see Mikey fighting. This is a business decision obviously for Garcia to face Commey rather than a more dangerous guy at lightweight or better yet one of the talented 140 or 147 pound contenders. This could be Garcia’s last fight at 135 before he moves up to 147 to challenge Errol Spence Jr. for his IBF title in the first quarter of 2019. The timing wasn’t right for Mikey to face Spence in 2019 because of the big heavyweight clash scheduled on December 1 on Showtime pay-per-view on December 1. Having Mikey Garcia vs. Errol Spence Jr. taking place on Showtime PPV in December a well would be too much of a strain on the pocketbooks of the boxing fans for the month. As such, Garcia will be making a title defense against the 31-year-old Commey in the tailend of 2018, and then looking to make the fight with Spence in the first quarter of 2019. It’s still unknown which network that will televise the Garcia vs. Commey fight, but it’s possible that Fox will be the one that shows it, according to ESPN. This would have to be viewed a as a disappointment for Matchroom Boxing USA promoter Eddie Hearn, who has been trying to ink the 30-year-old Mikey Garcia to his stable lately. Hearn wants to have Garcia as the lynchpin for his DAZN platform. Adding Garcia to his stable would help the British promoter lure other top fighters to join up with him so that he could attract Americans to subscribe to DAZN, which is a subscription service that sells for $10 per month. ESPN+, another subscription service that also streams boxing content, goes for half the price of DAZN, goes for $5 per month. It’s unclear if that price will stay at that level in the future. Commey, who comes from Ghana, lost to Robert Easter Jr. and Denis Shafikov by 12 round split decisions in 2016. Those were narrow defeats for Commey, but clear losses. Since then, Commey has bounced back with three wins over soft opposition in beating Hedi Slimani, Alejandro Luna and Yardley Armenta Cruz. The victories for Commey earned him the mandatory spot with the International Boxing Federation to challenge Mikey for his IBF lightweight title, which he captured last July in beating IBF champion Robert Easter Jr. by a 12 round unanimous decision. As mentioned previously, Commey lost to Easter Jr. by a 12 round split decision already in 2016. « Jerwin Ancajas to be ringside for Rungvisai vs. Diaz on Sat.